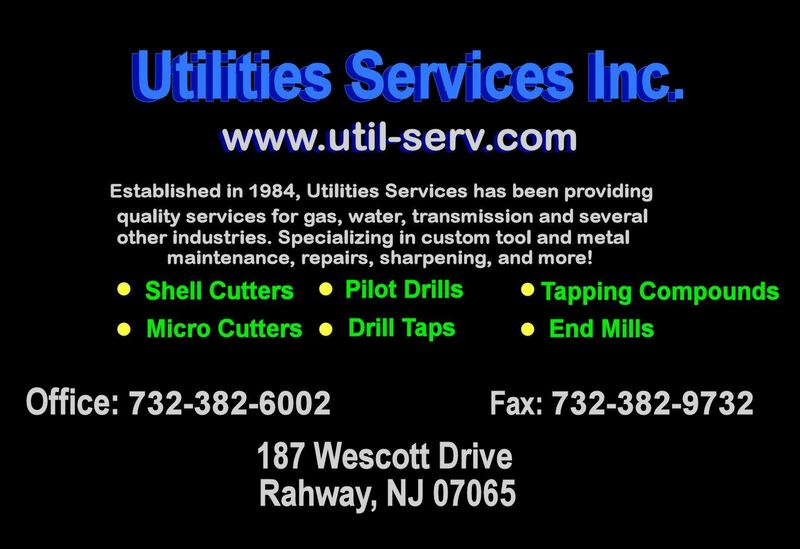 Utilities Services Inc. was established in 1984 for the purpose of the development of products for the gas and water transmission companies. It was and still is the intention of our company to provide the best quality shell cutters, pilot drills, quick change hubs, drill taps, our own tapping compound, custom metal work such as sharpening, and much more. Our sister company, Hone-A-Matic Tool and Cutter is a special tool manufacturing company, established in January 1960. Thus we have many years in the tooling and repair business. All of our products are made in the United States of America in our New Jersey plant. We sell shell cutters, drill head pilot drills, cl hubs, cc hubs, tapping compounds, and much more from our extensive inventory. If you do not see a product you are interested in on our site just give us a call 732-382-6002. All of the base material used in the manufacturing of our products is American made. We welcome you to examine our products. All of our products have been field tested by our customers. We guarantee that you will be more than satisfied with the quality of our service and products.